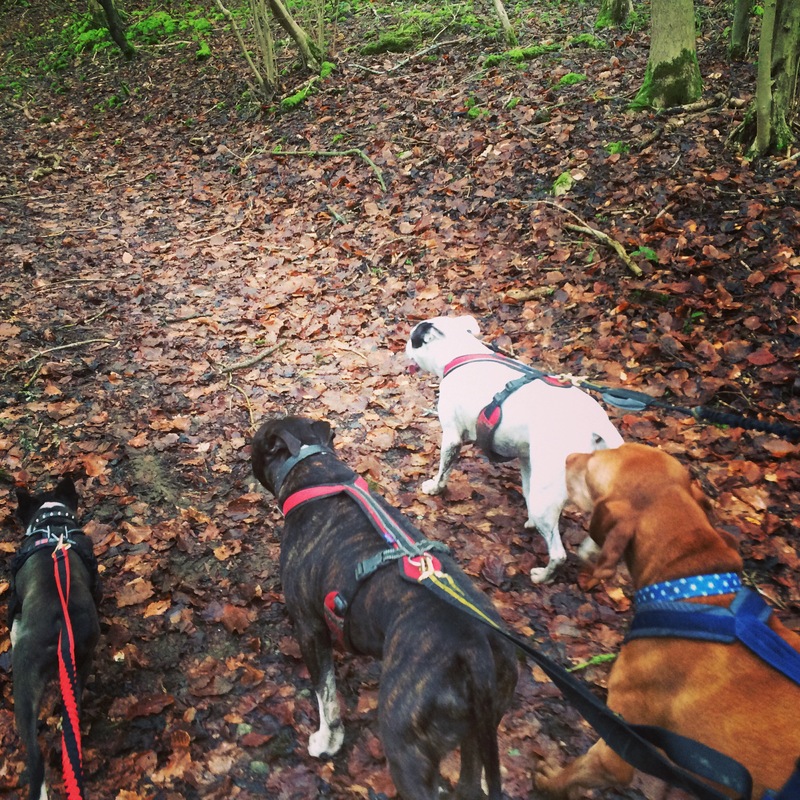 Canicross Commands – Top Tips! Whether you are new to canicross or someone who is already actively running with your dog, I would highly recommend introducing a few directional canicross commands. Remember, your dog may be a natural puller, but they are running in front of you and will be looking to you (figuratively speaking of course!) for guidance. Not only does this make your life, and that of your dog’s, that much easier but it’s a great way for the two of you to bond. And through combining a physical workout for your dog with the use of commands this also helps with general training and confidence. As well as making your life so much easier, throwing in a few commands is great fun and your dog will appreciate it! Here are some of the canicross commands that I’ve introduced with my dogs. There is no right or wrong – some people will have different commands that they like to use. The main thing is that you are consistent, confident and clear and that you use a positive tone of voice. A useful canicross command to use when you set off from standing still and during a run when you want to raise the tempo. Whilst in many situations you won’t need to use this command as most dogs are raring to go, especially when they are running in a pack, it’s good discipline and gives your dog clear guidance on when you want them to really pull for you. Just make sure that when you use this command you raise your voice and sound confident – just call out one firm and positive ‘Let’s Go’. It’s also a useful command to use in combination with the ‘stop’ command. A really useful canicross command and one of my favourites, which looks great in front of your friends! When dogs first start canicrossing they will naturally follow the direction of the dogs in front. Every time you take a left or right turn, start saying the relevant command at the point the dog turns (you can also tug gently on your bungee line) and start turning your body in the direction you wish to go and your dog will instinctively follow. Over time (remember consistency is key) your dog will turn left or right on command without any extra help. This is particularly useful if you are running out in front, on your own or have to negotiate technical courses, such as forest trails. Some dogs are more distracted than others and it’s not always easy to get them to run past an interesting smell or object without them wanting to stop and investigate. ‘On By’ is a useful instruction that they need to ignore something, stay focussed and keep pulling. If you don’t like ‘on by’, find a command that works for you and stick with it. This is useful to keep your dog focussed when they hit a junction or obstacle and to keep them pulling forward. 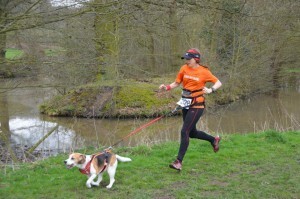 Caroline and her gorgeous Beagle Bindy showing everyone how it’s done! This can be a tough command to perfect, especially if you have a very energetic and strong dog, but an excellent command if you want to get your dog to run alongside you (or slightly behind you), especially when you are running downhill! I use ‘with me’, others use ‘heel’ or ‘here’. Some people will even train their dogs to run ‘behind’ them so this (or ‘back’ may be your preferred command. Ideally you want to practice the command when you are walking initially and then build up from there. Use the line to bring your dog closer to your side as you say the command. As they say, practice makes perfect, and whilst this one can be a challenging command to perfect, you will reap the benefits (and your knees will thank you too!). And when you want to go back to your dog pulling in front, just use your ‘Let’s Go’ command so they know it’s time to work harder for you. *Not everyone chooses to teach their dog to run alongside them downhill. 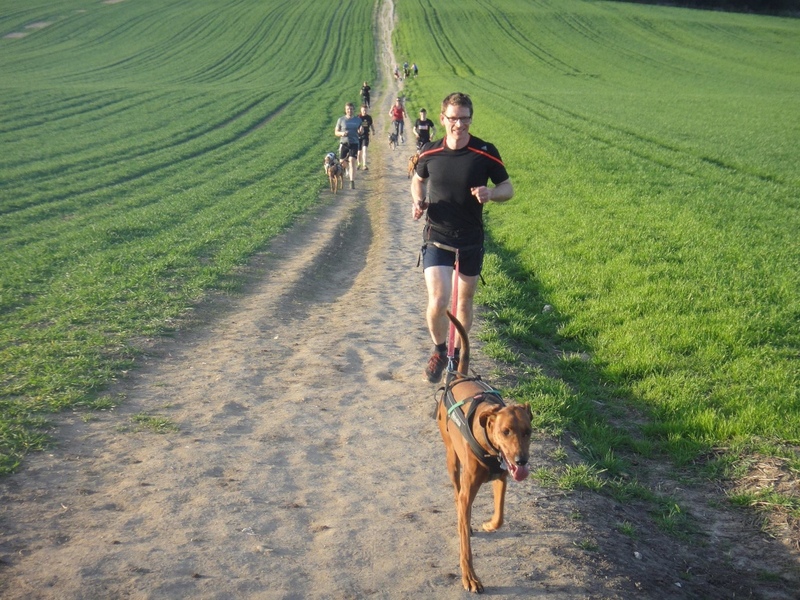 If you are super confident, you aren’t prone to knee problems and want to get downhill as fast as possible then let your dog run in front, lean slightly forward and widen your stride, keeping focussed on the terrain ahead. This is a useful canicross command to use in conjunction with you slowing down. When you want your dog to stand still and wait – ideally they should maintain their forward facing position. Use consistent commands to communicate with your dog. Using commands will really help with your canicrossing and is very rewarding when it works, and practice makes perfect! So persevere, make sure you are consistent and remember to (verbally) praise your dog at the point they respond to your command. Also, if you use your own body weight to assist with the commands, eg. lean slightly forward and pick up speed when you say ‘let’s go’ or lean back slightly and slow down when you say ‘steady’ this will help the dog pick up the commands quicker and you’ll have a much more positive and in tune running experience as a result! Use of canicross commands will help you get the most out of your runs. 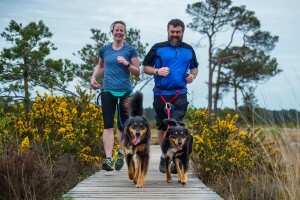 Discovering canicross with hearing dog Evie, following a small stroke. Can you canicross with a dog wearing a muzzle?